"Great for packing in a lunch." Preheat oven to 350 degrees F. Combine flour, oats, baking powder, baking soda and salt in a medium bowl; set aside. Beat peanut butter and butter in a large bowl with mixer at medium speed until smooth; beat in oil. Beat in brown sugar and sugar until blended, then eggs and vanilla. Stir in flour mixture and chocolate chips, if desired. Shape dough into 1-inch balls. Place 2 inches apart on ungreased cookie sheets. Flatten with fork dipped in sugar, making crisscross pattern. Bake 10 to 12 minutes or until lightly browned. Remove to cool completely on wire rack. Store in tightly-covered container. These came out so yummy! I was a little nervous using the Mazola Corn Oil but it worked out great. 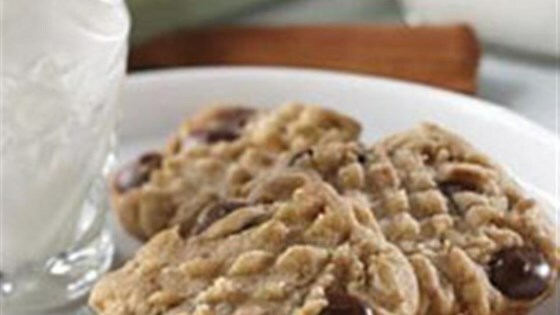 This is a cookie I will definitely make again! These were really tasty. I couldn't help myself and added about a 1/2c extra oats :) They did take a lot longer to cook than stated. They sure didn't last very long around here.